The Final Grand Announcement! « I'd rather be in France. Well, we’ve made it to the final announcement! This one has been our most closely guarded secret for the last six months. When the concept of the business was born, it was clear that it would be a meeting of Arthur’s penchant for fried chicken with my love of baking. We wanted a name that would represent both of these things. After brainstorming with some friends, we ended up with Drums & Crumbs, a short, fun and clear name of a food brand with two signature dishes: Southern-Style Chicken and Seasonal Fruit Cobbler. It will also have an assortment of other traditional sides and desserts. Keep in mind that we are still at the beginning of our brand development. We wanted to share the name and the concept with you so that you can help us make some of the fun decisions along the way. We are keeping a simple blog of our progress while our graphic designer and web developer are putting the real website together. We’ll also post those sorts of updates on our Facebook page and on Twitter. We are currently working on the logo and the design scheme (something we hope you all can help us narrow down when the time comes), so our pages will be looking a little colorless for the next month. All the more reason for you to keep checking in with us to see how things are coming along! 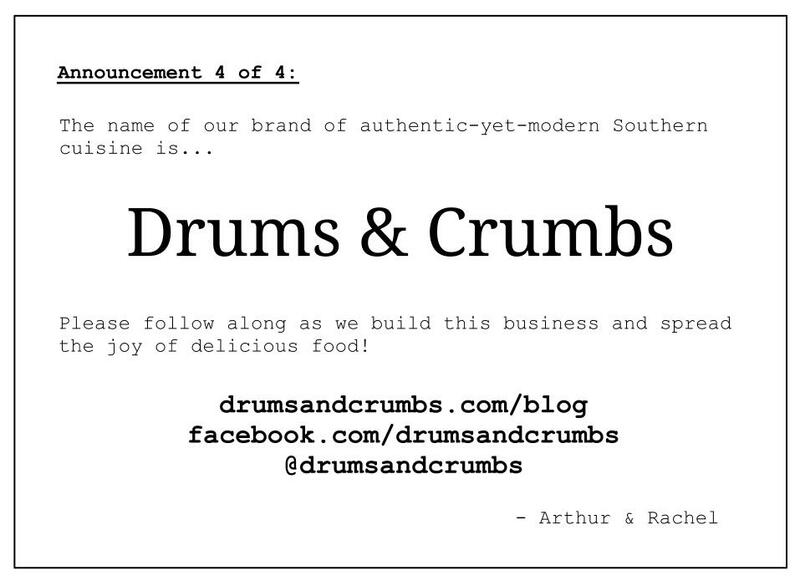 I’ll still write about my perspective of the whole process on this blog, but drumsandcrumbs.com/blog will have more regular updates on how the business is coming together. Thanks again for joining in on this adventure! This entry was posted on January 31st, 2013 at 12:05 am and is filed under The Business Of Business, What's this all about?. You can follow any responses to this entry through the RSS 2.0 feed. You can leave a response, or trackback from your own site. Happy Birthday, Rachel…. and Happy Birthday, Drums and Crumbs! I have really enjoyed following your blog and wish you, and Arthur, the very best! Congrats!